Owens said the county will participate during this phase of the cleanup, providing comments on both the design and, eventually, the construction phase. After the EPA announced in October the removal of tons of toxins from the waste pits, there initially was concern that the companies would fight, resulting in years of litigation and cleanup delays. In fact, the companies responsible for the cleanup previously said they would oppose a removal plan as too risky for the environment, which could have forced the EPA to go to court to carry out the plan. The EPA’s removal announcement in October came just two weeks after officials confirmed that a concrete cap used to cover the pits since 2011 had sprung a leak during Hurricane Harvey’s flooding. 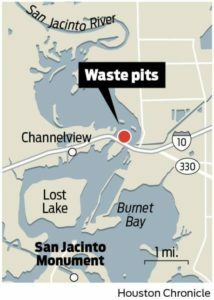 After Harvey, agency officials found dioxin in sediment near the pits at a level more than 2,000 times the EPA standard for cleanup. Subsequent testing, done after the cap was repaired, showed far lower levels of dioxin in that area, officials said in a December meeting. U.S. Rep. Pete Olson said in a statement Monday that he’s pleased to see state and federal officials taking this step. The waste pits became a federal Superfund site in 2008. 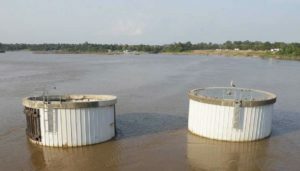 The U.S. Department of Justice and EPA now will start working with the companies to agree on methods for the cleanup.